Manufacturer stability is 36 months. Store at 25°C (77°F) with excursions permitted between 15-30°C (59-86°F). Do not freeze. Aggrastat® is provided in a carton (100 mL vial and 15 mL bolus vial) or foil overpouch (250 mL bag) for protection from light during storage. Aggrastat® provides storage and administration conveniences compared to other GPIs. The product information presented in these tables is not necessarily indicative of clinical efficacy, safety or improved treatment outcomes. Please refer to prescribing information for each product. 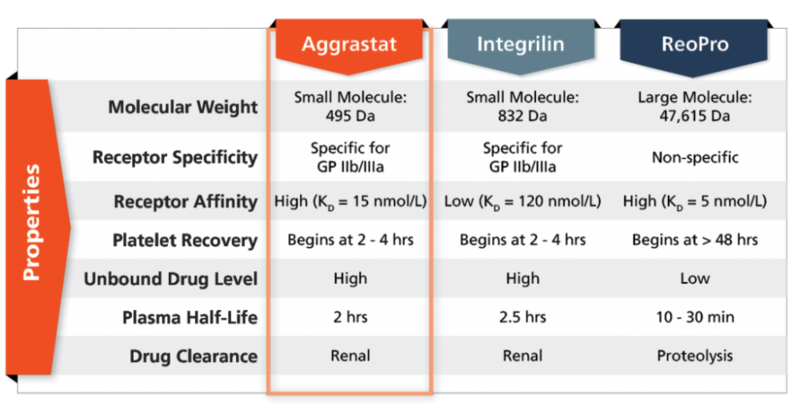 Aggrastat® may be purchased directly from a specialty distributor or wholesaler.